What Font Should I Use For My Resume? Here’s a very basic resume writing question: What font should you use for your resume? It’s not an insignificant issue. First of all, you want your resume to be legible. And you want your resume to be legible (easily readable) not just for human eyes, but also for computer eyes… in case your resume might be scanned into a database. You want your resume to be legible if faxed, scanned, transmitted, emailed as a photo attachment, etc. But secondly, and just as important, the font you chose can communicate a lot about your professionalism and intentions. If you’re an accountant, you want to stick with normal, conventional “professional” fonts. But if you’re a graphic designer, you want to and probably need to be a little more adventurous in your font choice. So what are the fonts I would recommend using for most professions in most cases? I’d say this is the safest bet for most people. It’s the most common professional font for a reason. It’s highly legible and professional looking. The downside: you risk looking just like everyone else. A good font to use for very traditional or “stuffy” jobs. Veranda and Arial are both excellent Helvetica substitutes. Highly legible and familiar to most people. Another common and legible choice. An excellent and very common font, but I find that it looks too much like an old type writer font (which it’s intended to do) and… this is just a personal preference… I feel like that makes a resume look a bit dated. Here’s a list of fonts I found on a resume template website. This is a good list that I’d stick to pretty much exclusively. In the end, resume font choice can be a personal decision. Go with what looks best and makes you feel the most confident and professional. But don’t go too far afield. Unusual or showy fonts can make your resume stand out in a bad way. And of course, if you need some resume help with your resume writing, you know where to go. 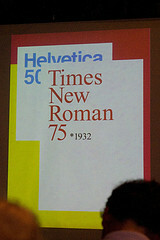 Times New Roman is a universally default font – it shows a lack of care and attention to detail. It’s also the second most hated font of all time, just barely behind Comic Sans. Anyone who reads the onion is a fool. Elliot, you are a fool. Anyone with a sense of style loves comic sans, Times New Roman being the default font around the world means that it is the most efficient and most effective. Quit hatin on the Norm. Thanks for the great tips and info!! Among font snobs Arial is one of the most hated. They claim that it was made by microsoft as a cheap helvetica replacement. Problem is that it was made by IBM and they used a type of grotesque front that was a sister to the grotesque font that helvetica was based on. Learn your font history! Piss off an uppity hipster design wanna-be! But I agree, don’t put your font in the default font of word. Times New Roman is a fine font, but using something different can make your resume stand out. It won’t get you the job, but it might get your resume out of the massive in-pile that HR picks through and into the hands of someone who might actually READ your resume. Ryder, you’re the uneducated fool. If you have anyone who knows anything about design looking at your resume you better not be using Times New Roman. They’ll throw away that resume before they even know your name! (I’m a graphic designer but I’m sure this goes for people in marketing as well). And you think people love comic sans.. are you kidding Ryder???? Take a design class PLEASE. Brian: What are your thoughts about this font? Pingback: What Font Size Should I Use For My Resume? You all are fools. The author didn’t even touch on the use of “green” fonts. What a waste of time. Bakersville Old Face is definitely not a green font. Save our planet. Choose a green font. Use less ink! Brian, Thank you for your help. I will let all the others bicker back and forth about the million or so fonts out there. I just wanted to say THANKS for the suggestions. Hey, I stand completely corrected on the spelling. I blame auto correct. However, I very much stand by my listing of what are considered to be best practice fonts for resumes. I’ve been using Optima as my sans serif font for contact info, section headers, companies, titles and dates and Palatino as my serif font for any bulleted items. They fit very nicely together. I think it’s an improvement over Times and Arial/Helvetica with subtle yet noticeable differences perfect for use on a resume.